In a rather fitting turn of events, Kansas Speedway ended up soaking wet Saturday night, putting out a rain delay for the first-ever SpongeBob SquarePants 400. 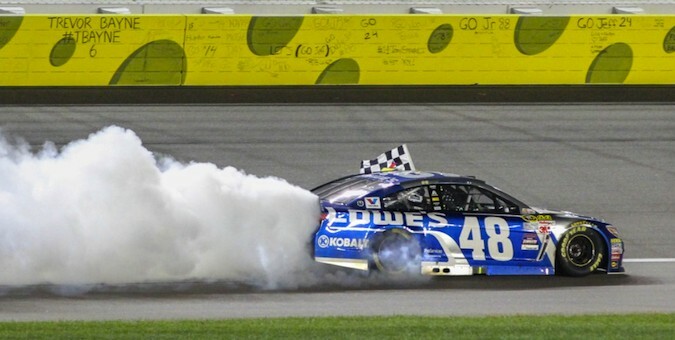 But when racing resumed on Lap 94, Jimmie Johnson was able to fend off a determined Kevin Harvick for his third win of the season and third-ever on the 1.5-mile circuit at Kansas. While many could have guessed Johnson, who’s looking for his seventh-ever NASCAR Sprint Cup championship, would win at Kansas, it didn’t seem as though the Hendrick Motorsports driver was on his way to victory in the beginning stages of the race. Johnson led just ten laps, much less than Martin Truex Jr.’s race-high 95, and even spun out early on, forcing him to the back of the pack. Johnson was able to pull up to the front of the grid and move into first position thanks to a late-race pit strategy from crew chief Chad Knaus. Following the race restart, defending series champ Harvick looked primed to win his third race of the season. He took the lead on Lap 55 and extended it to over 1 second with just 14 laps to go, however Roush-Fenway’s Ricky Stenhouse Jr. then clipped the wall, bringing out the final caution of the race. Harvick then pitted for tires and fuel, while Johnson opted to stay out on used rubber. Upon the restart, Johnson, Harvick and Dale Earnhardt Jr. quickly established themselves as the race’s only potential winners. Harvick restarted sixth and worked his way back up to the front of the pack, but was never able to reel in Johnson, despite him having the faster car. After the race, Johnson said the idea to stay out while Harvick pitted was up to him. The highly competitive Kansas race had several leaders, including Truex Jr., Brad Keselowski, Matt Kenseth and Erik Jones, who celebrated his first ever Sprint Cup start Saturday. When it was all over, Harvick was second behind Johnson followed by Earnhardt Jr., Jeff Gordon and Joey Logano. Other Chevrolets in the top ten included Kurt Busch in eighth, Truex Jr. in ninth, and Ryan Newman in tenth. The Sprint Cup series will head to Charlotte next week for the Sprint Showdown and NASCAR All-Star race, followed by the Coca Cola 600 the week after. Chevy rules again and again! !